Turn your back on spring asparagus at your peril. It has taken my asparagus bed four weeks to produce its first four spears. But tonight I picked 13 finger-fat ‘Pacific Purple’ spears (one was 30cm long!) for dinner – we ate it steamed, with fresh egg pasta, smoky bacon and parmesan cheese – and there are another 21 spears still out there, poking their heads out of the soil. Guess what we’ll be having for dinner tomorrow night… and the next night… yum! Ps. 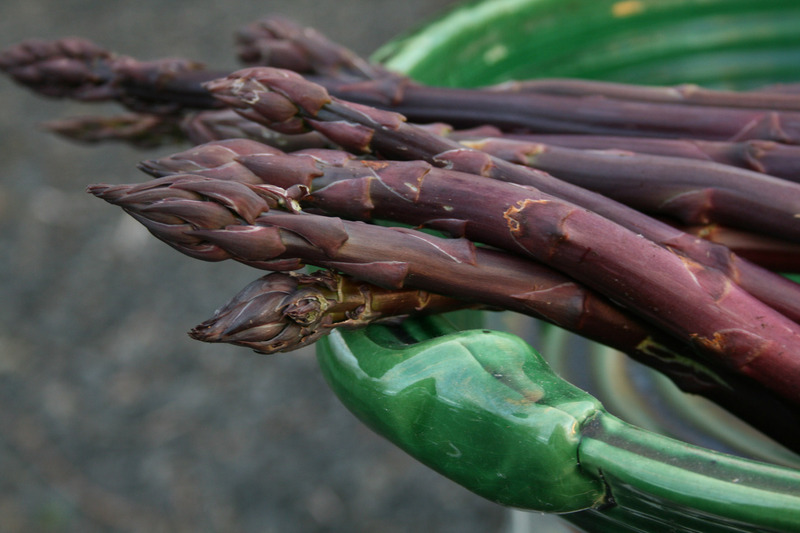 In case you’re wondering, the answer is yes: purple asparagus, like purple beans, loses its colour when cooked. It doesn’t turn completely green though, more like a greeny-purple. I haven’t had any time for blogging this week; we’re up to our eyeballs at work finishing Homegrown Flowers (if you order it now, you can get it for just $11). 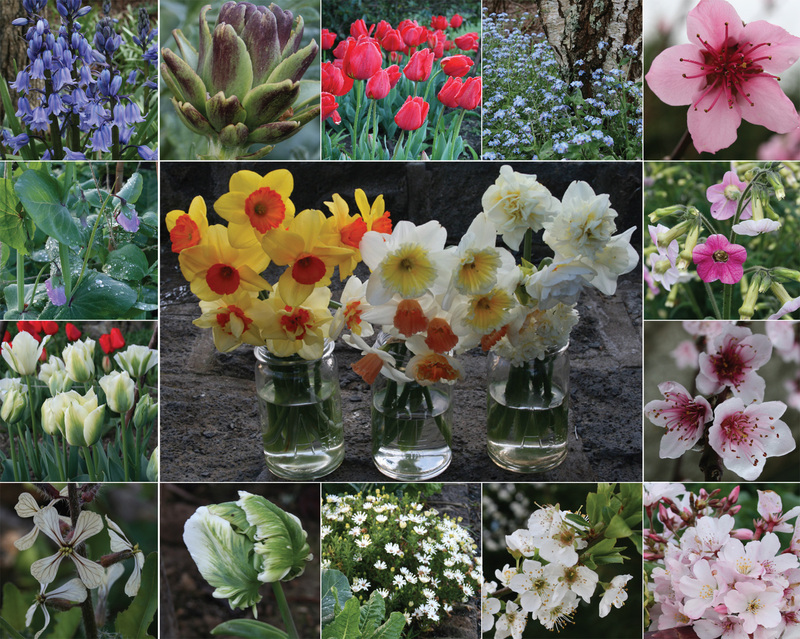 So here’s a pic (click on the picture to get a better look) of all the homegrown flowers in my garden this morning. (One of the joys of being horribly late getting my bulbs in over winter is that I’ve still got loads of daffs in bloom now.) The tulips have been particularly stunning this spring; I’m amazed how well they’ve stood up in the torrential rain we’ve had this week. The bluebells and forget-me-nots under our liquidambars are gorgeous; my globe artichokes are delicious; and all my peaches, plums and cherries are blossoming. 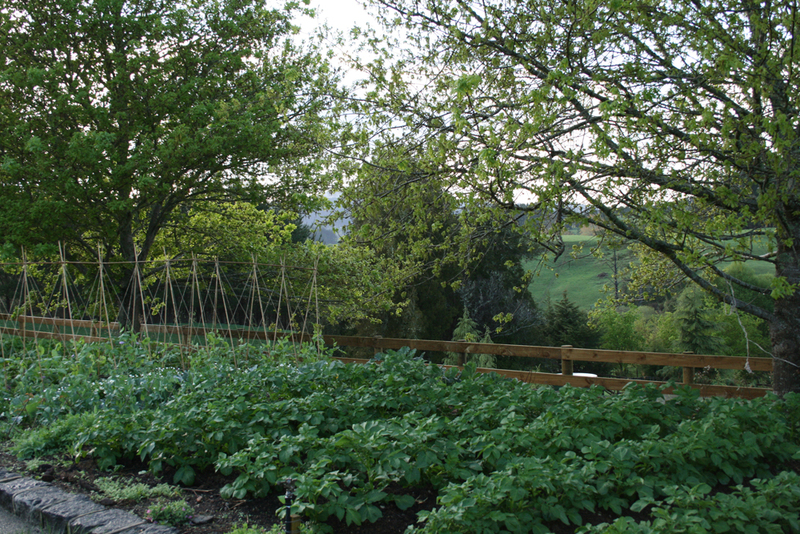 Meanwhile, in the vege garden, we’re going to have enough spuds to feed half the local community. Inspired by all the furrowed fields in the market gardens around Pukekohe, I just can’t stop planting them! 12 bags to date… it will be interesting to see which varieties do best. I’ve put in ‘Jersey Benne’, ‘Cliff’s Kidney’, ‘Purple Heart’, ‘Ilam Hardy’ and two new varieties from Tui called ‘Moi Moi’ and ‘Summer Delight’. 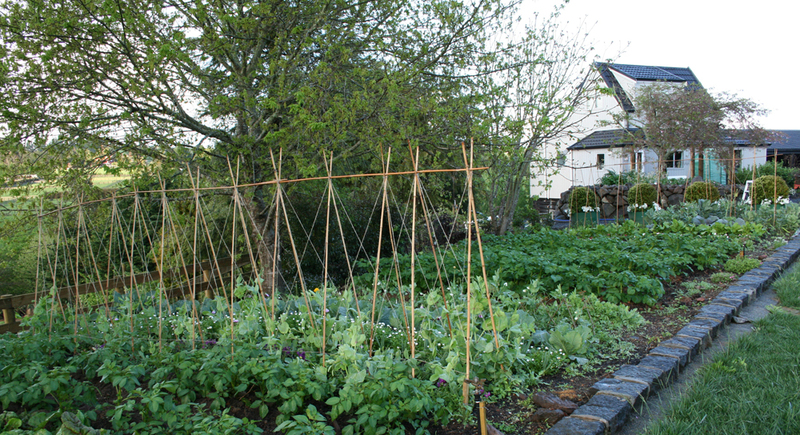 It’s incredible how quickly everything takes off after a couple of nights of heavy rain. My lettuces have gone from scrawny seedlings to big-headed beauties (better start eating them). And I’m as pleased as punch with the progress we’ve made planting everything in rows around the lawn. But I really wish I’d stood my ground in the discussion (translation: argument) that my darling husband and I had over the design of our vege garden. He was adamant that I was not allowed to plant right up to the edge of the rock wall around the lawn, because otherwise we’d end up leaving muddy tracks all over the lawn every time we lugged a load of compost down there, or pushed the wheelbarrow, or dragged the hose along. So instead we’ve got an ugly (but practical) 40cm strip down the side… that’s slowly filling up with weeds… except those weeds are all self-sown wildflowers, and I can’t bring myself to pull out free plants, so I guess I’ll get my way in the end. Here today, gone tomorrow... the fleeting beauty of cherry blossom. I’m so glad I took this photo of the cherry blossom tree in the bed beside our front door yesterday. For weeks it has been sporadically spitting out the odd blossom, but at the weekend it was as if every bud suddenly burst open at once. It was magnificent. Was being the operative word. After a day of wild, wet, windy weather here, there’s barely a blossom left on its branches. 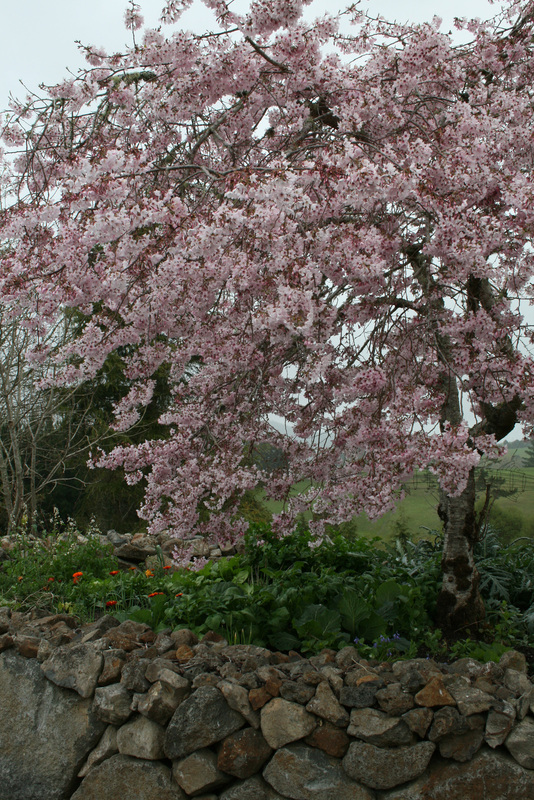 Ah well, at least the rock wall under the cherry tree looks quite pretty in its candyfloss pink coat.